Lord Howe Island is Australia’s answer to Shangri-La. As you fly in, it looms out of the Pacific, an almost mythical landscape with huge volcanic rocks, forested mountains and emerald water. It’s dazzling. Locals call it “the last paradise” and it’s just as lovely at ground level. No matter how much you associate Australia with beach life, Bondi and Surfers Paradise have nothing on Lord Howe’s white sand and stunning Norfolk Island pines — amazing trees that are tall and straight with branches like a conical monkey puzzle. Lord Howe, about 600km off Australia’s east coast, was a memorable first stop on my voyage for a new TV series to 16 of the 8,000 or so islands that ring the island continent. If, like most people (including many Australians), you just visit the famous mainland sites such as the Sydney Opera House and Uluru, you’re missing out. Australia’s islands open up a new world. They offer beauty, exotic wildlife, marine creatures and extraordinary people. The islanders are the common factor between the very different places. Whether they’re relative newcomers or have lived there for generations, they share the Australian pioneering spirit — you can still claim a bit of land here and make a go of it — with a self-sufficiency and pride in the welfare of the community that takes you back in time. 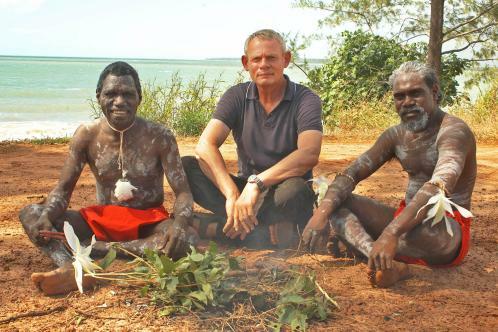 The locals have an otherness to the mainland; they aren’t just Australians living on an island. On the Tiwi Islands of Bathurst and Melville, in the far north above Darwin, the Aboriginal people keep the old way of life going, as customs dictate, while functioning in the 21st century. I went foraging with local women along the shoreline, teasing out worms and mud whelks and the shellfish called long bums. I had a grand old time with the laughing and nattering older women and teenagers. It felt very natural. I couldn’t understand a word they were saying, but it was a lovely gentle afternoon’s hunting that was a privilege to be part of. Everyone here is obsessed with Australian Rules football. A third of the island, including the girls, play the game — they have the only indigenous team in the country — with some of the players starring with big professional league teams. The chance to play at school is an added incentive to get an education. It was the most positive view of Aboriginal life in Australia I’ve seen. Farther west in the Torres Strait, off Australia’s northeast tip, on Thursday Island, I found a more mixed local heritage. Like the Balearics, they’ve been invaded by everyone on the way up or on the way down. They’re a cultural mish-mash, with the original Melanesian settlers, Japanese pearl divers and the influence of Australia and nearby Papua New Guinea. This mix has left its mark on the music. I hung out with Seaman Dan, whose blend of calypso, bluesy, rocky music has propelled him to fame in his eighties. He sings at festivals but mainly spends his days sitting outside the shop that sells his records on Thursday’s only main street. His grandson is a hip-hop artist who performs songs about local life and the challenges facing young islanders as they grow up. The island doesn’t get many visitors but you can cross to nearby Friday Island for a tour with Kazu Takami, one of the few locals. Japanese and a former pearl fisherman, he runs Queensland’s sole remaining cultivated pearl farm. I watched mesmerised as he delicately implanted a tiny irritant — a speck of shell — into the soft moist flesh inside the oyster, kick-starting the formation of a cultured pearl. It looks like a gynaecological procedure. I had no idea that this is what is behind a cultured pearl. I have heard people say, “Oh, they’re cultured pearls,” as if they’re something inferior, but they’re still made by a shellfish, and it’s still a remarkable process. As I travelled around the islands, I realised there’s something else that makes them particularly interesting to a Brit: the immediacy of the settler history. It’s very precise. At home we might know the king’s name in the 11th century and vaguely what happened but Australia has written records for everything: at 11.17am these men called so-and-so landed here and did this. You sense that recent, more detailed history on Maria Island, off Tasmania’s east coast. Its prison buildings remain so complete. It even has the ovens for baking bricks. The system was that having been sentenced to penal servitude, prisoners had to dig the dirt, make and bake the bricks and build their own cells. The Victorians cherry-picked trades to construct the penal colonies for free. You’re a stonemason who nicked a loaf of bread? Right. Transportation. The convict story is even darker on Norfolk Island, home of my favourite pine trees. This is Australia’s easternmost island, 1,500km into the Pacific, where the penal colony was a truly awful place, with prisoners kept in solitary confinement in underground cells flooded by the tide. The mean-spirited governor was torn apart by a work gang when his carriage threw a wheel and he asked for help. The remains of that brutal past are embraced as a tourist experience, but the place has evidence of more recent events: people’s surnames, Christian, Quintal and Adams, are from descendants of the famous mutineers from The Bounty who settled on Pitcairn before moving to Norfolk Island when their population grew. It has its own dialect, which mixes 19th-century English with Tahitian. I had it written out phonetically, but still found it impossible not to lapse into West Indian patois for no good reason. The flora and fauna unique to each island have to be seen to be believed. 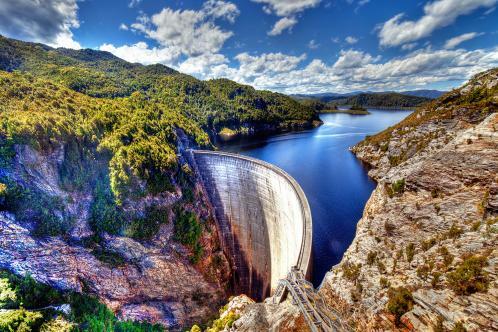 In Tasmania, with its beautiful forests, they don’t just have Tasmanian devils, kangaroos, wallabies and wombats — they have quolls. I’d never heard of one, let alone seen one. We were filming a conservation project that breeds Tasmanian devils on Maria Island to reintroduce them to Tasmania (where they’re dying out), when we found a quoll in one of the traps. They’re spotty, with pointy noses. Apparently they’re a native cat, but they don’t look like any cat I’ve seen. Nice, though. There’s something more manageable for a Pom about the countryside in Tasmania. I think it’s to do with knowing that the huge and scary expanse of Australia’s Red Centre isn’t round every corner. This was my second visit to the island and I’d forgotten how much I loved its forests, with the Huon pines and the gums. The route from Hobart up to Triabunna, with the light strobing through the trees as you drive, is stunning. If you’re not interested in quolls, you might like quokkas. Rottnest Island, a favourite family destination a 90-minute ferry ride from Perth, is overrun with them. They’re sweet, small, stocky marsupials with rounded ears, a permanent smile and no fear of humans. A favourite pastime is to get a quokka selfie. Yes, I spent a few hours behind a number of unworried furry little creatures, trying for the perfect shot with my purpose-bought selfie stick. My most memorable wildlife encounter was in the Indian Ocean. The deserted Muiron Islands lie on Ningaloo Reef off Western Australia. They have vivid coral and tropical fish, but snorkelling alongside a whale shark for a mesmerising half-hour was one of the best natural experiences I’ve had — up there with swimming with manta rays in the Maldives. They’re so huge it felt almost cheeky to be swimming so close to them, but with the same ease and generosity of spirit that the quokkas had about the selfie thing, these giant fish let me hang out with them, and yes I did get a whale shark selfie. Like that first glimpse of Lord Howe Island from the air, it was a highlight of my odyssey around Australia’s beautiful, diverse and always surprising islands. Getting there QantasLink (qantas.com) has year-round scheduled flights to Lord Howe from Sydney on most days, and from Brisbane on weekends from £565pp return. From February to June and from September to December it runs a weekly service from Port Macquarie. Where to stay Pinetrees Lodge (pinetrees.com.au) has B&B rooms from £119pp per night. The lodge offers wellness and adventure packages, as well as walking and photography weeks. 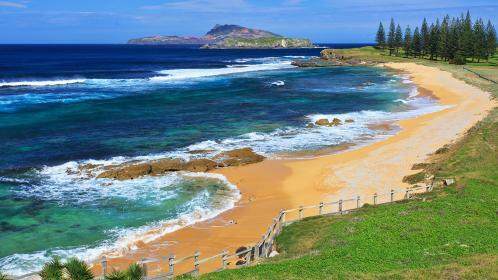 Getting there Air New Zealand (airnewzealand.co.uk) flies to Norfolk Island from Sydney or Brisbane from £439pp return. Where to stay The boutique Cumberland Resort and Spa (cumberlandresortandspa.com) has one-bed self-catering villas from £104 a night. Getting there The Tiwis can be visited only on an arranged tour with an Aboriginal guide and permit (most leave from Darwin). For £174pp return, Fly Tiwi (flytiwi.com.au) goes to Bathurst from Darwin. Getting there The Thursday Island ferry leaves from Seisia on the tip of the mainland for £67pp return (peddellsferry.com.au). Or fly from Cairns to neighbouring Horn Island from £243pp return (qantas.com). A 15-minute ferry ride connects the islands. Where to stay Thursday Island’s Grand Hotel (grandhotelti.com.au) has B&B doubles from £131 a night. What to do Pay an extra £19pp to add a guided tour to the ferry trip (peddellsferry.com.au). Or leave Thursday Island to visit Kazu Takami’s Pearl Farm (00 61 74069 1268) on Friday Island. Getting there Jetstar (jetstar.com) flies daily to Hobart from Melbourne from £52pp and from Sydney from £103pp. Where to stay Hobart’s Islington Hotel (islingtonhotel.com) has B&B doubles from £171 a night. Where to stay The coolly revamped Hotel Rottnest (www.hotelrottnest.com.au) on Thomson Bay has doubles from £139 a night. 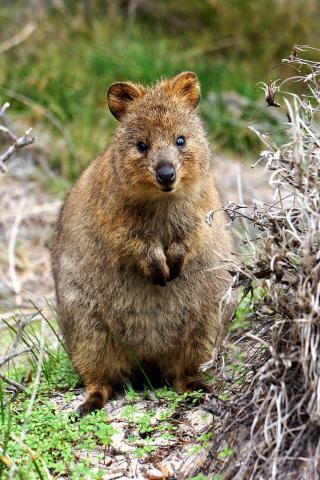 What to do The Rottnest Voluntary Guides Association (rvga.asn.au) conducts free walking tours to attractions such as the quokkas or Wadjemup lighthouse.